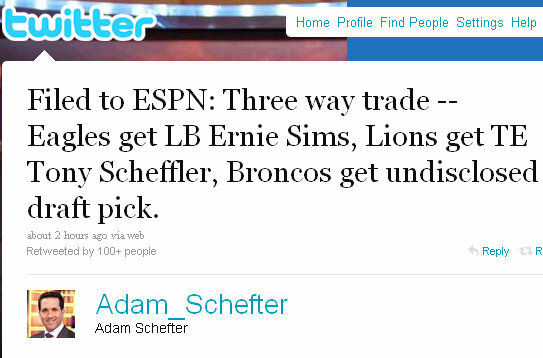 Adam Schefter reported via Twitter that the Detroit Lions have acquired tight end Tony Scheffler, and a seventh-round pick from Denver in exchange for sending linebacker Ernie Sims to the Philadelphia Eagles. The Philadelphia Eagles are betting on the fact that Ernie Sims can bring his career back to life on the Philadelphia defense. 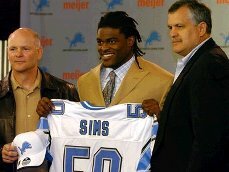 Sims was a team captain and is considered an excellent leader on the team. Recently, the Philadelphia Eagles have lost two key leaders from their team in Donovan McNabb and Brian Westbrook. Both of these players were key franchise players, and strong leaders in the locker room. Now with Donovan McNabb having moved on to Washington, Michael Vick is going to have his opportunity to shine in the quarterback position. Coach Andy Reid is definitely looking to build the right team that has the power to go beyond the playoffs in the upcoming year.